In the late 1840s, a surgeon named Robert Little surveyed the waters off one Pulo Blakang Mati in his search for the probable causes of a remittant fever suffered by both natives as well as those newly arrived in the tropical Far East. 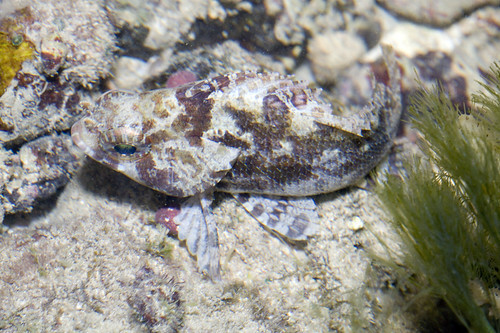 His pet theory was that the ailment could be correlated with the presence of coral reefs, and as a result the good doctor conducted a number of expeditions along the shores of Singapore and the southern islands to ascertain his hypothesis and observe the health of the people who dwelt by local reefs. During Dr. Little's survey, the island had been largely cleared of jungle, save skirting mangroves, and housed three villages, Blakang Mati, Serapong and Ayer Bandera, whose occupants cultivated pineapples and fruit trees. 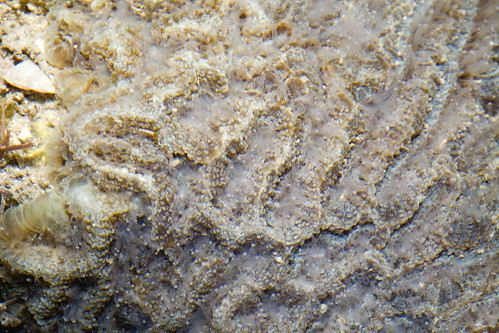 Though his notion that coral reefs, or more specifically decomposing polyps, emitted a miasma of decay that contributed to outbreaks of malaria was later falsified, the good doctor's efforts to gather data in the field resulted in reports that offer a glimpse of the past splendours of Singapore's waters in a time before dredges and the dull imagination of human development. "In front of the village of Ayer Bandera, Blakang Mati, are two reefs, one attached, as a fringing reef, to Pulo Brani, and the other to Blakang Mati; betwixt them is a deep channel of from five to eight fathoms in the centre, though close to the coral it is of very little depth, so little, that you can from a dry coral reef, step into 4 fathoms, in the next step. The Reef attached to Blakang Mati, whose influence is felt by those living in Ayer Bandera, is of a triangular shape, the sides of the triangle not being less than 1/2 a mile. 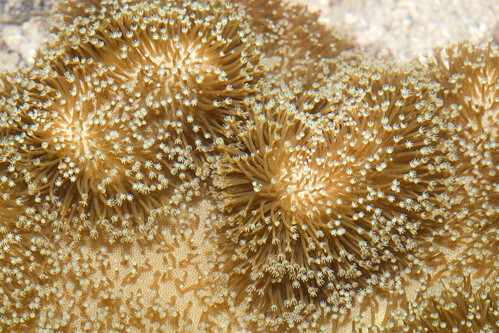 The reef attached to Pulo Brani is about 3/5 of a mile long, but of no great breadth; at low water, spring tides, one can look down into a depth of from 4 to 9 fathoms, like as a school boy does on a wall and looks at the objects below, which here are living corals of many and wondrous shapes, with tints so beautiful that nothing on earth can equal them. 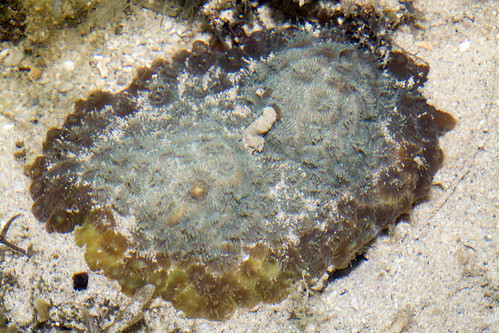 While the lovely coral fish, vyeing with their abodes in the liveliness of their colours, are to be seen peeping out of every crevice, on the reef, which at full tide has but a few feet of water to cover it, and is exposed at low water, are to be seen nothing but dead masses of coral with living ones of a different species fringing them, and here and there in spite of the sand, a few shoots of the branching madrepores, and a few detached madrepora fungia." In the present day, the living shores of Sentosa (for the island was renamed in 1970 to erase its rustic history) have been largely reclaimed, reined in and ruled out from the future of a post-modern resort isle, a giant theme park of entertainment and escapism where legends and lore are twisted into decontextualised fantasy. Walls of stone guard the southern flank, keeping leisure craft and pleasure seekers safe, for the most part, from the wilder depths of the straits. What remains of the fevered isle brood in pockets of little interest to fans of soft beaches. To the northeast, the seaward perimeter of a golf course shelters, less by design than disregard, a reef and fringing mangroves that are probably shadows of what once ringed Blakang Mati. The northwestern tip of the island, which form with the promontory of Labrador a fanged gateway to New Harbour, offers another foothold for gardens that face the floating reefs of Keppel Bay. Patches of seagrass, both clumps of Enhalus with long, fibrous strands as well as fragile beds of spoon seagrass, dot the sandy slopes that face a turbulent channel. Even in the outgoing tide, the foreshore advances only to be swamped by the wash of passing vessels. The sun had already set, but the dirty glow of fortunes that never fade was enough to show the presence of a handful of men wading to their waists and bearing contraceptions of mesh. Later, we would find some of these traps, baited with fish heads and secured by rope to terrestrial anchorage. The probably target of these cages, portunids of nocturnal bent, were abudant in the pools and clearer patches of silt that rose as the day rolled into an urban twilight. The larger, more esteemed, members of the family were absent from our survey, however, which crossed instead the paths of countless blue-green swimmers, some still soft and feeble from a recent moult and others alert and eager to nip threats in the intertidal bud. 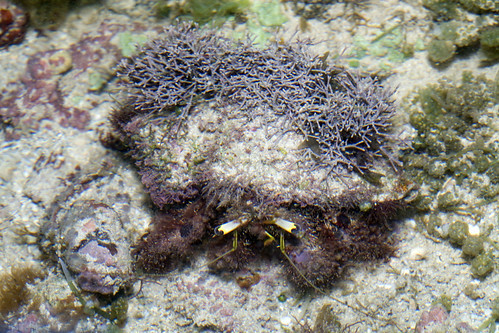 Sharing their shoals were matutids, less sleekly built but no less speedy crabs with eight flat feet that allow the animals to dig in and dim out in the blink of an eye. The seawall soon gave way to a semi-natural scene of pier rubble and broken cliffs, which other marine crustaceans have colonised up to a tree line of coastal xerophytes. Sea slaters scramble over low outcrops, ready to dart into crevices should their feeding and frolicking be disturbed by avian predators or waddling ducks. Occuring in numbers that do not reach the pestilential strength of the isopods are metopograpsids which navigate with spidery ease steep surfaces lubricated by mucilage. 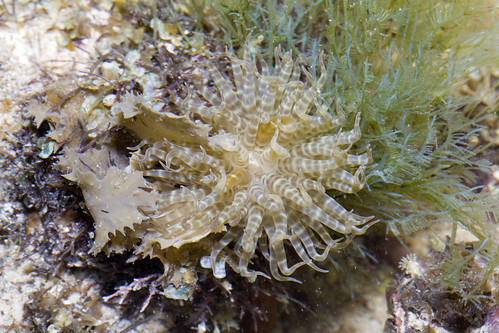 These slippery filaments, fuelled by the sun and the scum of a chemical sea, nourish the rock climbing decapods, along with slugs, limpets, nerites that graze in the relative safety of the littoral zone. 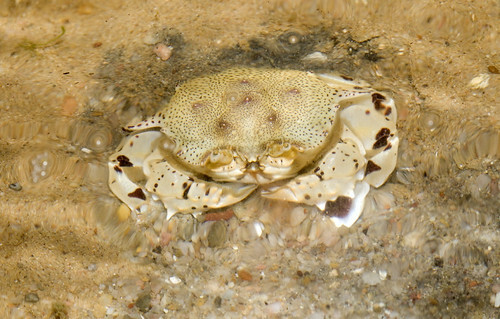 Molluscs without noxious defences, however, still risk running into shore crabs with the tools to crack tough shells. 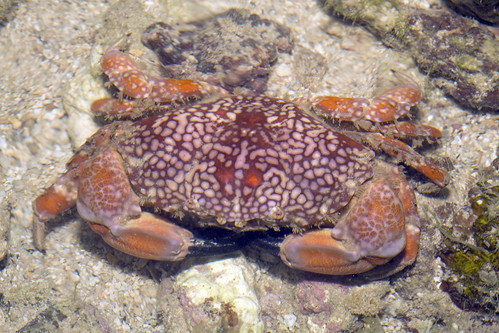 A few forceps crabs swung into the shadows of rocky clefts when their hunt was interrupted, while red-eyed reef crabs prefer to dash into shallow water and wage a war of wills between frail skin and fingers with teeth. Where the tide leaves basins of sediment and organic wealth, small brown crabs with spoon-tipped pincers browse and grapple with even tinier cousins that'd remain invisible to tidepoolers until one deigns to stoop or squat. 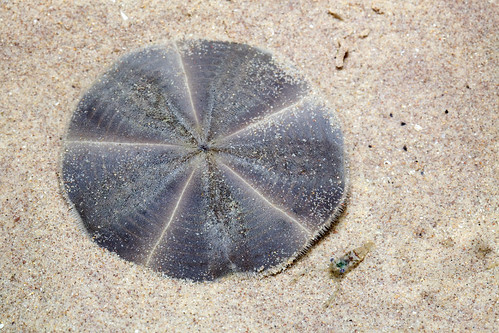 In the same ponds are pretty anomurans with spotted limbs and eyes and orange feelers, which occupy the coils of late drills and nerites and like their striped congeners, are not averse to a little landlubbering when the sea is low. 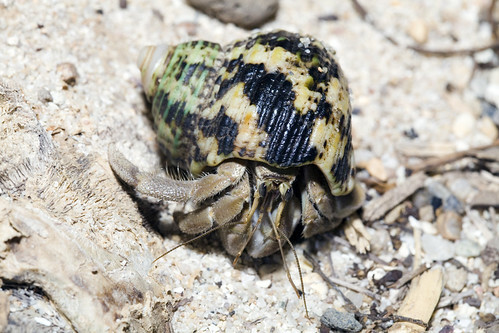 Other hermit crabs seldom, if ever, take a dip into the dry. 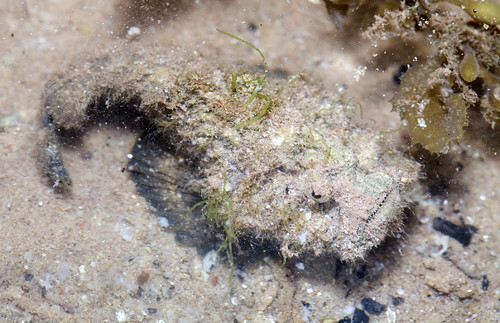 One such creature is a large, hispid lumberer with yellowish eyestalks that occurs on southern reef flats but is seldom noticed as its hairy legs and oft overgrown home effectively disrupt the succulent form of edible shellfish. Another uncommon inhabitant of nearshore rubble, but one with little need for camouflage, is a xanthid of catholic appetite and lethal flavour. 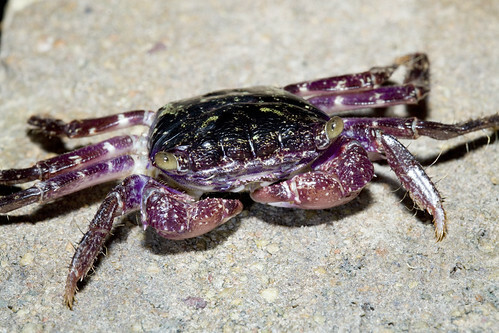 The cliffs of Tanjong Rimau, which crumble before a shore of liquid crystal and live rock, provide perhaps the easiest passage to the hunting grounds of a crab whose beauty belies a body of fatal attraction. 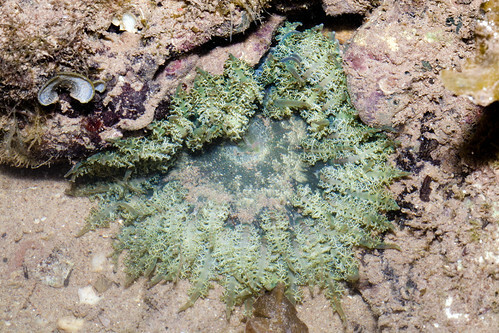 The corals that survive here belong to hardy genera of massive or submassive habit: Porites, favids and other slow-growing colonies adapted to the rigours of intertidal life and turbid waters. A few even attain boulder dimensions, but most are content to rub shoulders with gaudy sponges and rippling octocorallia. In this landscape of grooved plates, arms and pores lurk thousands of transparent shrimp who dance on any stage, alive or dead, that does not devour them tail and claw. Other, less indiscriminate, carideans lie low amid primitive encrustations and refuse to break cover even when probed by fleshy ends. 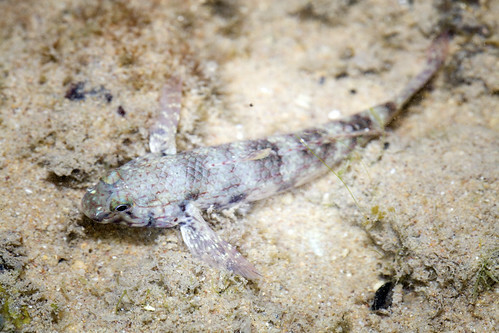 Ubiquitous but largely out of sight are alpheids in their burrows, which they may share with a mate or platonic gobies. 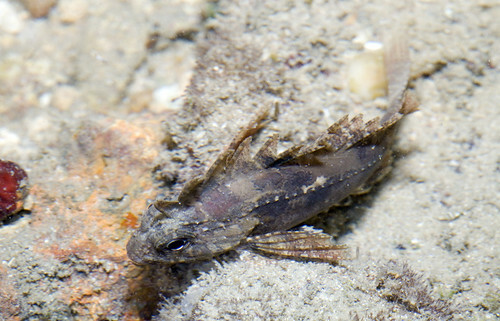 Nearly as abundant as the glassy shrimp, small gobies swarm about sandy clearings, where they face slightly better odds against encountering the jaws of predators in plain view. Long fin spines, mottled colours and the disposition of a lumpen heap endow varying degrees of disguise to monsters of miniature scale. 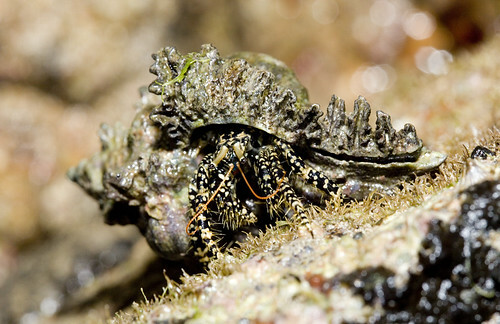 Scorpionfish, groupers and stonefish rule the reef alongside spineless hunters: sea anemones that cling to weed or peer from the substrate; octopuses with a head for nombers and polyclads that glide over rock and rubble in pursuit of sessile prey or somebody to love. Two crabs bookended this excursion, the first evening tide of the year. 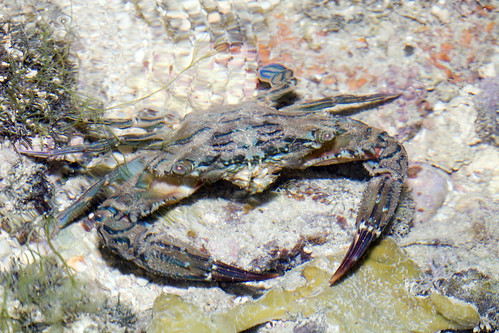 A mature horn-eyed ghost crab greeted us when we first descended to the shore below an underwater world of captive attractions. 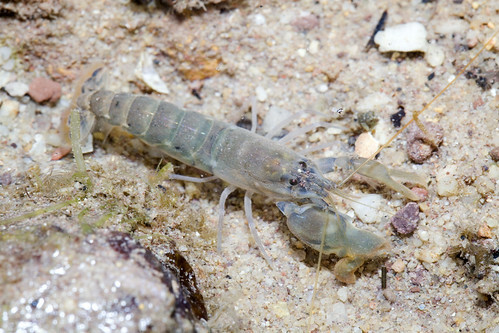 The ocypodid's presence suggest that the beach enjoys a measure of freedom from activities inimical to semi-terrestrial decapods. A population of coenobitids, survives, too, in the shade of the coastal forest near the hind end of a high class hotel which has escaped the attention of people who want their strands spick and blandly span. The final act of the night, though, was not the rummaging land hermits, but a rarer scavenger associated with higher ground than its more abundant kin. 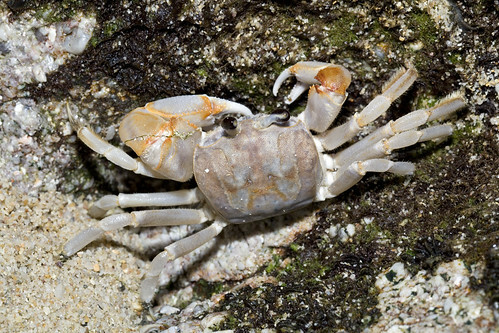 Spotted at the base of a cliff near a hollow of shallow caves and preserved for biological posterity, the ghost crab was another sign that these shores stand a chance of regaining, in stuttering waves of larvae and megalopae, the reefs they had lost to a century and more of human import. Where did you get those quotes from? Fascinating!